Comments: Samuel A. Ellis (Nee: ) | MN United States | | Comments: *** PLEASE NOTE: Photograph was captured from an online auction and I do not have the original, nor any additional information. All identifying and genealogical information was provided by the seller of the photograph. However, in *some* cases I may have done a little research on the name and added it to the comment field also as, "NOTE:", to help researchers with the photograph. 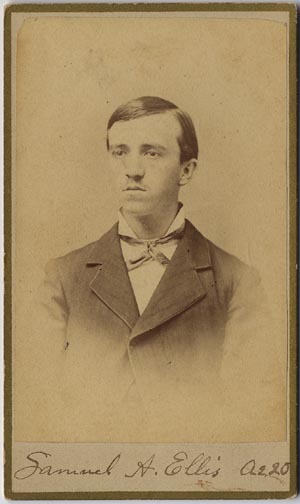 *** SAMUEL A. ELLIS: This is a CDV photo of a 20 year old man, identified as “Samuel A. Ellis.” Photo was taken by A.G. Bacon in Braidwood, Minnesota, ca. 1883-85.